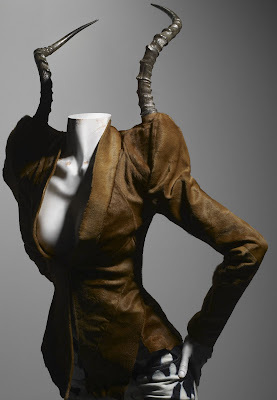 For any of you lovelies so inclined, this Sunday, June 19, is the Sundays at the Met series that will feature the lecture "Alexander McQueen: Art, Beauty, and the Unique Body." It will be led by Harold Koda, Curator in Charge of the Costume Institute, and Aimee Mullins, a former model for McQueen. It's free with museum admission but go early, the McQueen exhibit has proven so popular, this lecture could end up being standing room only. "Alexander McQueen: Art, Beauty, and the Unique Body"
Absolutely stunning, ahhhhhhhhhhhhh, so much beauty. I wish I lived in NYC. This would be a fantastic exhibit to see. Oh, you make me want to get on a plane and camp out for several months. These museum announcements are like candy! Hi Sacramento, isn't that jacket with the horns on the shoulders just wild? I would like to see the inside seams to get a sense of what is holding them in place. 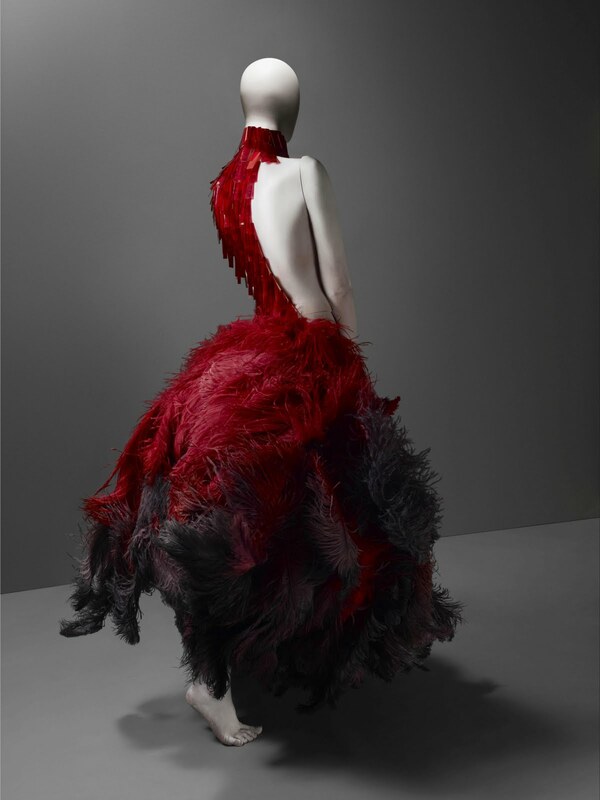 The red bodice of the feathered dress is made up of medical slides painted red and used as paillettes. Hi Adrienne, I wish you were here too, I need to see this exhibit again and if I have to stand in a huge line, I'd like to go with someone fun! Hi Terri, I was out of the museum loop for so long because of having children and being in the mommy trenches. It's wonderful to be going again, reminding me of an aspect of New York I've loved since I moved here. You have a wealth of museum opportunities in NY and this would be a fabulous exhibit. The red dress is amazing with the "medical slides"... what a creative spirit! I am as lost as you are in twitter. I just want to be there, but I do not let it rule my life or have it on my phone, hehhehe. I am more of a facebook fan. Are you on facebook??? Hi Genie, the fashion exhibits at the NYC museums have been especially fine in the past year. As for the red medical slides used as paillettes, the more I read about McQueen, the more I understand how fearless he was in the use of all kinds of crazy materials. I admire him for it. Hi again Sacramento, I will be trying to get the hang of Twitter for a long time! I can see why it's addictive though. It's fun! I am not on Facebook yet, I hope to be sometime soon.